If these don't look like pie, you would be correct, sir. 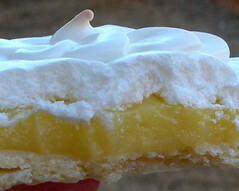 In my year making desserts in an Indiana tearoom, I had to make two lemon meringue pies every Thursday morning for one customer who would always request them. So when Jen at The Canadian Baker picked lemon meringue pie for our January challenge, I knew I would be trying some of the alternatives. Now I'm finding myself wondering how many Daring Bakers are named Jen. Hmm! The tartlet you see in the front is the option we were given along with the challenge - freestyle lemon meringue tartlets. 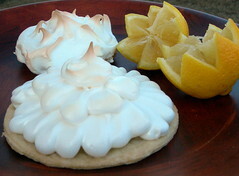 These were basically circles of the pastry, baked, with lemon curd scooped on top and surrounded by meringue. I decided they would look pretty as flowers and squeezed the meringue out of a ziploc bake in a flowerlike pattern. The smaller tart in the back was just a teeny pie, basically. I had these four cute tart pans that have been begging me to be used in a recipe, any recipe, so I made four little tarts and four freestyle tartlets. I had a lot of everything left, but am putting on a tea this afternoon, so the lemon curd will be lovely for that. This recipe was pretty good. I thought the crust was perfect, and the lemon curd was a wonderful texture, although it had quite a few more random steps than the one I usually make (cool the water for 5 minutes?) - I know several bakers had issues with the firmness of the curd, but I have to admit that once I got to a certain point I was going entirely by feel since I have made lemon curd so many times. I even got to use a flat silicone whisk that I got for the holidays, so was geeking out a little because of the new toy. My only issue with the recipe is the salt level of the finished product. I may have waited too long to add it to the meringue, but regardless, the taste was visible, and way too much. 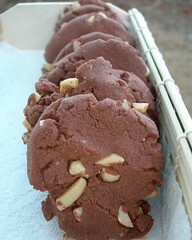 If you are curious to see other renditions, please check out the Daring Bakers Blogroll. We just keep growing and growing! Some of my favorites include bakers who worked in other fruits - blueberry sauces, blackberry coulis, yum! It has snowed twice in the last week, and is bitterly cold today. This is not that common where I live in South Carolina. Cold weather makes me want to create the opposite - something warm, or even spicy. I have had some of the Nestle Chocolatier chocolate bars in my cupboard since my plan to make Seven Layer Bars for Christmas again this year evaporated. Ever since then, the chocolate has been calling to me. "Eat me!" it says. "You don't need to put me in a recipe." Lately, I swear, they have been screaming. So I took revenge and went on the hunt for a recipe to use up the chocolate, something I could share easily. I found this recipe for Chocolate Shortbread Olé on the Nestle Chocolatier site, where every recipe I have tried has been superb. Last February I made their Decadent Chocolate Satin Pie as well as the Chocolate Mayan Bundt Cake. Microwave small chocolate pieces in small, uncovered, microwave-safe bowl on high (100%) power for 45 seconds; stir. If pieces retain some of their original shape, microwave at additional 10- to 15-second intervals, stirring just until melted. Cool to room temperature. Combine flour, cinnamon and cayenne in medium bowl. Beat brown sugar and butter in large mixer bowl until light and fluffy. Beat in melted chocolate. Stir in flour mixture until blended. Stir in pecans. Shape dough into 1-inch balls; place 2-inches apart on ungreased baking sheets. Flatten with bottom of glass dipped in sugar. Bake for 10 to 12 minutes or until edges are set. Cool on baking sheets for 2 minutes; remove to wire racks to cool completely. Jenny's notes: The dough was very dry and crumbly as made, but came together pretty well with my hands. Next time I would add a little less flour. The cayenne pepper really adds a kick, and is a wonderful addition here. I made a few small changes - the chocolate I had was 4 oz. of bittersweet and 4 oz. of semisweet, so I substituted that for the dark chocolate. I also neither had pecans nor did I think that sounded like the best nut to use - I had almonds that I didn't want to have to throw away, so I toasted them up on the stove. As someone newly transplanted to the south, I like to try and bake some southern treats from time to time. I was skeptical of this recipe, as I am of many of Paula Deen's recipes - for instance, I don't believe I'll ever be able to make her fudge that has velveeta as a secret ingredient without gagging. No offense, Paula. 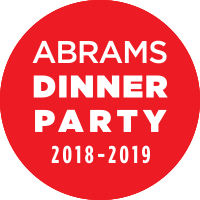 This recipe comes from The Lady & Sons, Too, the second cookbook from her very popular Savannah restaurant. She has the recipe available on her website as well as on FoodNetwork.com, so I will go ahead and copy it here for now. I actually own this cookbook, a gift from a minister I used to work with, but this is the recipe I find myself making repeatedly. Sometimes you use shortcuts while baking. This recipe uses canned biscuits! But by the time you have wrapped a dab of cream cheese in a biscuit, dipped it in melted butter, and dredged it in a mixture of orange zest, nuts, and sugar - you would never imagine any of it came from a can. The end result is a flaky, sweet (but not overly, balanced nicely with the cream cheese), impressive looking coffee cake, appropriate for brunch or a special breakfast. In a small bowl, combine the granulated sugar, pecans, and zest; set aside. Separate the biscuits. Place about 3/4 teaspoon cream cheese in the center of each biscuit. Fold each biscuit in half over the cheese, pressing the edges to seal. Dip the biscuits in melted butter, then dredge in the granulated sugar mixture. Place the biscuits, curved-side down, in a single layer in the hollows of a lightly greased 12-cup bundt pan, spacing them evenly (do not stack). Place any remaining biscuits around the tube, filling any gaps. Drizzle any remaining butter over the biscuits, and sprinkle with any remaining sugar mixture. Bake for 35 to 40 minutes, until golden brown. Immediately invert the cake onto a serving platter. 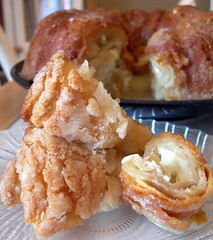 Combine the confectioners' sugar and orange juice, stirring well; drizzle the glaze over the warm cake. Serve warm. This time around, I left out the nuts, and it is still wonderful without them. Eventually I want to try making different versions of this - maybe a chocolate chip raspberry one, or a lemon cinnamon version. The possibilities are pretty endless, and the preparation is so quick using the canned biscuits! I also don't follow the directions about not stacking the biscuits. I always have a few extra, and I layer them around the center of the dish and it works just fine. You know it has been a completely crazy week when it is Friday before I realize I never posted in what is supposed to be a weekly Monday blog! Winter Term at the university where I work is the craziest time, and the music library has been hopping. Since I waited, I'm posting about something I made later in the week. I had a new co-worker start this week, and where I work, we have "Welcome Breaks" where people bring food, hooray. I actually made this recipe Christmas Eve (AKA Hubby's birthday) morning, but didn't photograph it then, so I repeated it for this celebration. 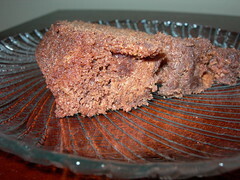 The recipe is Chocolate Cinnamon Bread, and I know it has been making the rounds on the baking blogs. 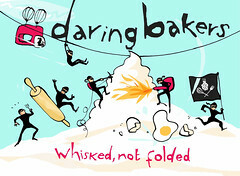 I first read about it on Taste and Tell, another one of the Daring Bakers blogs. I will let you go to her post for the recipe, and to see a picture of how it should look if you follow the recipe exactly. The first time I made it I did the spice mixture and sprinkled the bottom of the pans I used with it, but I used these silicone flower mini cake pans and everything stuck despite using non-stick spray. (This is why there is no photo from Christmas Eve!). I also had been out of cinnamon that day, so it was more of a chocolate spice (cardamom, ginger, and clove) bread. This time around I actually didn't have enough cocoa powder, so used only 3/4 cup and added an additional 1/3 cup flour. 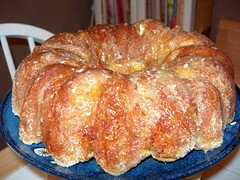 I also used a bundt pan instead of two loaf pans because I wanted it to serve more people. I took it out of the oven when the top was brown, even though I wasn't convinced it was completely cooked, but the texture seemed okay when it was cut into the next morning. That's why the picture isn't great - I cut a quick slice and snapped a photo on the entertainment center before jumping in the car to go to work! Crazy week, simple recipe, delicious fun! My first post of 2008! Happy New Year, everyone. At our house, we drink a lot of tea. I mean a LOT of tea. Only the good stuff. I even played around with making some blends of my own for my husband for Christmas this year - his favorite was "Larkin in the Morn," a malty rich breakfast tea blend. With tea simply must come scones. 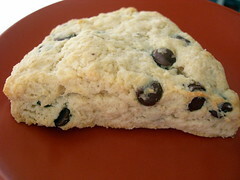 These may look quite a bit like the chocolate chip scones that I have blogged previously, but that recipe is a classic cream, butter, and baking powder scone. I was flipping through Baking with Julia, contemplating making croissants over the holidays (which I wimped out on), and came across the buttermilk scone recipe. I had extra buttermilk in the fridge from the cake I made, so thought I might as well. Easy enough. What I don't really understand is why this reaction is desired more than just using more baking powder, so I'd love to hear an opinion on those of you bakers who are more scientifically trained than I am. The texture of these was good, considering that they have far less fat than the scones with butter and cream, but I think I still prefer my traditional recipe. Baking with Julia is actually written by Dorie Greenspan, and I have grown to really love her cookbooks. I won't copy the recipe here, but this book is a baking essential. It has a nice combination of complicated recipes (like croissants, which I hope to eventually try) and good standards like this scone recipe.